This entry was posted in Racing on June 15, 2011 by Steve Tilford. Just when I thought I might be able to pedal my bike good for a bit, I got bit. You’d think I’d know better by now. I was trying to catch the mother cat yesterday to take to the vet to get spayed and thought I was past the cat-bites-the-human part of the relationship, but I was wrong. She chomped down on my finger pretty good. Nothing hurts more initially that a good cat bite. I think it is because their teeth go all the way to the bone. Maybe I’m wrong, but whatever the reason, it hurts. Much worse than falling down on a bicycle. So, I struggled most of the day yesterday trying to decide whether to take antibiotics. 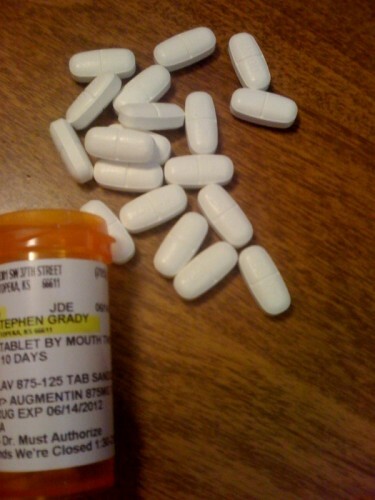 I had just almost got over a lung infection without antibiotics, maybe the first time in my life, but this isn’t that. Everything on the internet says I should. The main reason is because I don’t have a spleen, thus I am prone to infections. Especially infections to the blood, which is what eventually will happen to an infected cat bite. So, I bit the bullet and decided to write another month off riding bikes. That is not 100% guaranteed, but historically that has been the case. I’m pretty glad I got the antibiotics now. 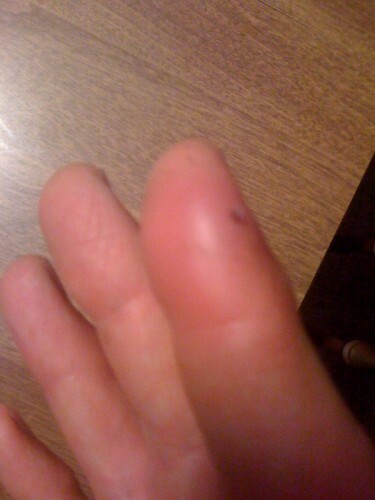 I woke up this morning after 4 hours sleep with my finger throbbing to my heart rate. It is huge. I’ve only taken two pills so far, so hopefully they will kick in pretty soon or I might need to do something else. Cat bites aren’t something to really mess around with. I guess I knew that, but I let my guard down. It’s a drag because it is my right index finger. Horse pills for 10 days. overall your recovery will be faster with the antibiotics than dragging it out until you eventually need them anyway. I’d soak it in hot water with salt/soap three times a day for at least 15 minutes at a time. This is what I do and what I recommend for cat bites: scrub with soap and water, or better yet povidone iodine scrub, and then soak the finger/hand in betadine (povidone iodine) solution (diluted in water to a medium to dark tea color). Then ibuprofen to minimize inflammation and ALWAYS antibiotics (and Augmentin, which you have, is ideal). The Cat needs to go give it to a rescue or somebody. It needs to go, you have done enough and everything will work out. Seriously, steve: you’re on a hell of a roll lately.